All about fishing for bowfin, chain pickerel, longnose gar, muskie, northern pike, sauger and tiger muskie in North Carolina. This state offers unique fishing opportunities. Listed below find information about these species of fish, found in North Carolina waters. Larger lakes across the state of North Carolina, with some of these miscellaneous fish populations, may include Badin Lake, Belews Lake, Blewett Falls Lake, Chatuge Lake, Falls Lake, Fontana Lake, Harris Lake, High Rock Lake, Hiwassee Lake, Hyco Reservoir, Kerr Lake, Kings Mountain Reservoir, Lake Gaston, Lake Glenville, Lake Hickory, Lake James, Lake Mattamuskeet, Lake Norman, Lake Rhodhiss, Lake Tillery, Lake Waccamaw, Lake Wylie, Mayo Reservoir, Mountain Island Lake, Phelps Lake, Roanoke Rapids Lake and others. 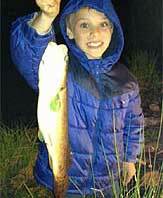 Try your luck fishing for bowfin, chain pickerel, longnose gar, muskie, northern pike, sauger and tiger muskie. Many of the species we portray as "other" in this website are simply not as commonly fished for as the more popular fish. For insight into some of these "other" fish in North Carolina, visit the other fishing page for more in-depth information. Best fishing lakes in North Carolina!